Trinity Designs: Father's Day is on it's Way! And for once, I have a head start on my cards! LOL! Hi everyone, I know it's been since Saturday since I posted, but we had an extremely busy weekend and then my hubby was off yesterday, so we were working around the house. Had to take advantage of him being home, kwim? This card actually started as my piece for the Stamping 411 sketch on Saturday, but when I couldn't get my words to fit the way I wanted it too, I just went with it and made this instead. I started with a card base of Baja Breeze that is cut at 4 1/4" x 11" long. It's scored in half at 5 1/2" then I ran it through my Big Shot with one of the Texturz Plates #4 to create the rugged background. Across the top is a piece of Riding Hood Red cardstock overlaid with a piece of Twill Tape. I frayed the ends a bit then attached it to the card with the Jumbo Pewter Eyelets and my Crop-a-Dile. For my focal point, I used two of my favorite alphabet stamp sets - both are RETIRING! - Short Order Alphabet and Big Deal Alphabet. You have to know that these two sets were among my all time favorites! When you see how "colorful" the wood blocks are from ink stains, you know they were well loved and much used! I will miss them a LOT! Anyway, thanks for letting me rant a bit about that! 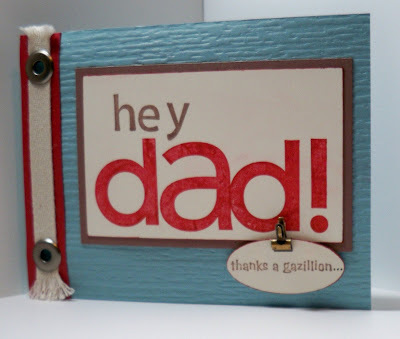 On Very Vanilla cardstock, I stamped the "hey" with Close to Cocoa ink using Short Order Alpha and I stamped the "Dad!" with Riding Hood Red ink using Big Deal Alpha. The trick I use to determine what size cardstock to cut for making titles is to first stamp the greeting or title onto my Grid Paper. I then measure how much space it takes up and cut my cardstock accordingly. Then when I stamp on the cardstock, I place it beneath the stamped image on the Grid Paper to help me line it up again. Pretty simple technique that works like a charm! Once I layered the focal image onto Close to Cocoa cardstock, I stamped the rest of the greeting with Close to Cocoa ink onto Very Vanilla cardstock, punching it out with my Large Oval Punch. I used the Really Retro stamp set for the greeting. This is a fairly new stamp set that is quickly becoming one of my favorites so I'm really glad that it is NOT retiring! I edged this stamped oval with a bit of Close to Cocoa ink and then adhered it to the card front with two Stampin' Dimensionals. The little Library Clip was added for emphasis and I think it finished the card off nicely! Thanks for stopping by today! Leave me a comment so I know you were here, ok? Oh, did I mention that I have the new catalog in my hot little hands?! Yes, I even have the new In Colors - with Markers! WooHoo! If you are registered for stamp camps/classes this month, you just might be able to get a little sneaky peeky! Maybe even a project to whet your appetite! But you have to be registered now, don't you! Go to my website at www.robinstamps4u.stampinup.net to check out my Events calendar and call or e-mail me to RSVP! There are lots of opportunities for you to come stamp with me this month! This is a great card Robin! I love it!